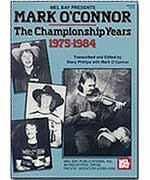 This book shows how Mark adapted what he learned from Benny Thomasson to produce an original voice in fiddle tune variation, becoming the most celebrated fiddle in recent history. Contains meticulously accurate transcriptions of the album of the same name. Includes hoe-downs, schottisches, waltzes, jigs, rags and polkas. The text details the first phase of Mark's career, during which he established a new standard for old-time fiddling. Several of the arrangements are presented more than once, with different arrangements and even keys to exhibit Mark's musical growth, stimulated by his continuing challenges to himself. Also included are an interview with Mark O'Connor by the transcriber and several photos from Mark's personal collection. Late intermediate to advanced in difficulty.